Situated on the A41 north of Whitchurch, Shropshire, our garage facilities are amongst the best in the area, staffed by time-served and experienced technicians who are committed to taking the greatest care to get your vehicle back on the road as soon as possible. We offer servicing for cars, vans, mobile homes, horseboxes and commercial vehicles, as well as a 24 hour emergency breakdown recovery service. Our MOT Testing Service covers Motorcycles Class 1 & 2, Private Cars Class 4, and Vans and Light Commercial Class 7. 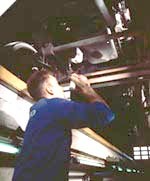 We also offer MOT Preparation for HGV vehicles, mobile homes and horseboxes. NEW FEATURE FOR TYRE QUOTES - Enter the tyre details or enter your car's registration number in the yellow box and get an instant quote for the range of tyres we can supply to suit your vehicle. 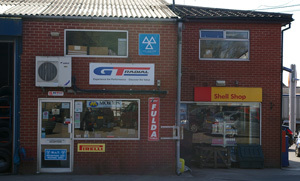 Note that www.grindleybrooktyres.co.uk is owned by D A Roberts Garage Ltd.